483 cases have been registered in the RA MES RS Crisis Management National Center from the period of June 11 to 17, 151 of which are emergency ones. 194 household calls, 66 fires and 53 road traffic accidents (RTA) were registered during the mentioned period, as a result of which 1 person died and 81 were injured and 4 citizens were rescued as a result of rescue operations. 10 cases of vehicle blocking due to bad weather conditions have been registered. Rescuers provided assistance to 10 citizens and 10 vehicles were taken to a safe place. 49 cases of snake detection have been registered. 10 cases of poisoning were registered during the week, as a result 9 citizens were injured and one died. 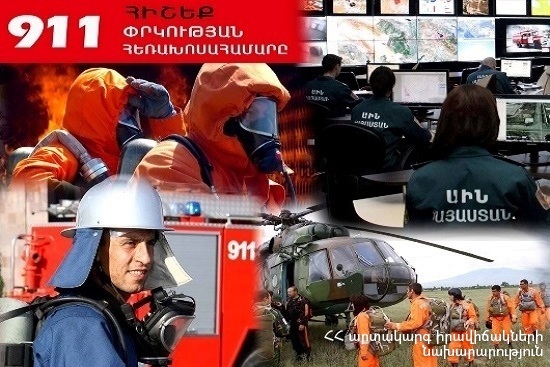 The Ministry of Emergency Situations of the Republic of Armenia urges both in everyday life and on roads to be as vigilant as possible and preserve elementary safety rules.